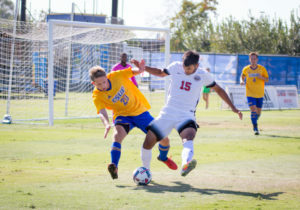 CSU Bakersfield took an early 2-0 lead at home against University of the Pacific on Oct. 4 as the Roadrunners got their third win of the season. 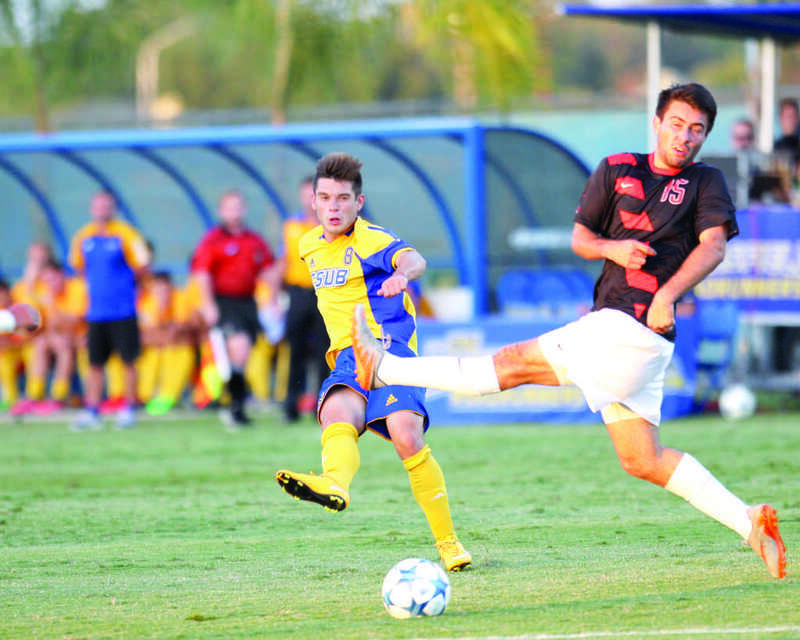 “I felt like I just needed that first goal, and I think it helped me get a little relaxed,” said redshirt-sophomore forward Julian Zamora, who scored in the fifth minute. 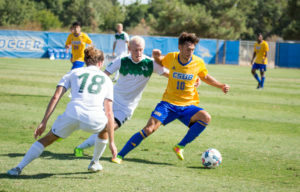 CSUB (3-3-2, 0-1 Western Athletic Conference) showed up with a great attacking presence with Zamora, who was assisted by senior forward Simon Doherty. 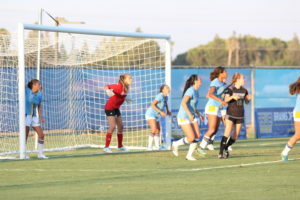 Good possession and control of the ball helped lead the Roadrunners to another goal by Doherty just three minutes later. 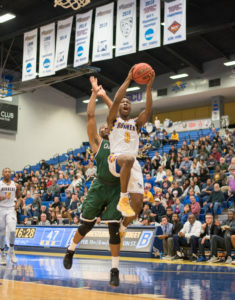 This is the first game where CSUB has been able to establish a scoring presence, open with some early goals and control the game from the start. 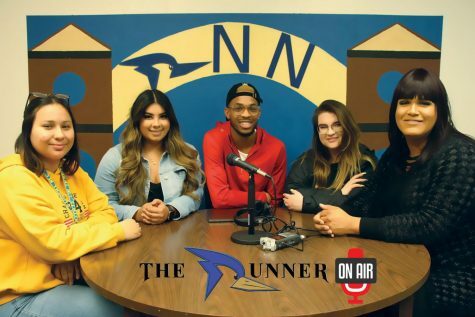 In the second half, the Roadrunners seemed to be on the defensive side of the ball more as CSUB freshman goalkeeper Oscar Gloveus stepped up in his first start and made some big plays that kept CSUB ahead. 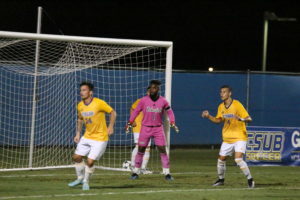 Gloveus had four saves in his first start and came off his line twice to prevent the Pacific offense from getting a chance on goal. 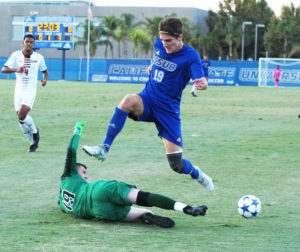 Grant said that they looked like they could’ve scored the third goal, but they needed Gloveus to come up big and protect what they had. 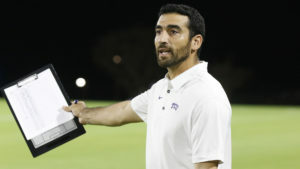 That third goal almost came off a free kick in the 72nd minute of the second half as senior mid-fielder Christian Duarte sent a shot in from about 23 yards away but was denied by Pacific sophomore goalkeeper Curtis Goldsmith. 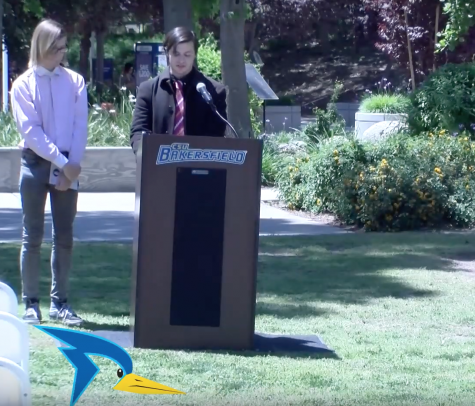 It was also a physical second half for the Roadrunners as sophomore midfielder Marshall Garcia, freshman midfielder Sam Gomez, and freshman defender Samuel Zimmerman were all issued yellow cards in an effort to keep the lead and not let any momentum build for Pacific. “So the positives here you know when you score first, particularly early, backed it up with a second goal, and then to give up nothing it’s a good night at the office,” said Grant. 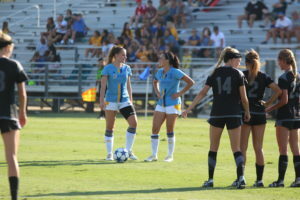 The Roadrunners will host Grand Canyon University next on Oct. 9 at 7:30 p.m., as they try to earn their first WAC win.